There’s something about a fine writing instrument. It makes you feel important. It makes your words special. It adds a touch of elegance and class to your everyday routine. If you are not a pen collector, you understand the significance of a fine pen the first time you pick one up. If you are a collector, you already appreciate the value. Regardless of your familiarity with the world of fine pens, we can all see the beauty of limited edition pens. Brands like Lamy, Montblanc, and Parker produce fantastically advanced, sophisticated and streamlined writing instruments, and when you add in the title of limited edition, the end result is truly a masterful work of art. Limited edition pens act as thoughtful and unique gifts as their beauty is undeniable. You can complement someone’s personality or inspire them with a limited edition pen. We’re taking some time today to highlight a few of our favorites and bestsellers to make that purchase even simpler. First on our list is the special edition 25th anniversary pen from Retro 51. The popular brand created a special acid-etched Tornado. The pen features “25” in a plated stonewashed pewter finish as the pattern as well as a barrel complemented with glossy rhodium accents. The pen contains a rollerball refill and is packaged in a special tube with the number inscribed on the top ring. This pen is on track with the brand philosophy of life being “too short to carry an ugly pen.” They infuse character and playfulness into quality writing instruments thereby making them more accessible and approachable. Next up, we have the Dialog 1 from Lamy. The powerhouse teamed up with world-renowned designer Richard Sapper to craft this futuristic pen. The ergonomic instrument combines durability with a modern sleekness. The ballpoint Dialog 1 is coated in matte titanium making its triangular body and rounded edges appear like something Tony Stark himself would pick up and sketch his next bodysuit with. Parker Pens is synonymous with elegance, quality, and talent. It is no surprise that the Ingenuity 5th Technology Year of the Dragon pen is streamlined, bold and beautiful. The Ingenuity collection is the next generation in fine pens. It combines a cutting-edge refill tip and engraved metallic hood that provides a smooth and smart glide feeling. While not a fountain pen, it acts and looks like one. Choosing the right fine pen is not an easy task. The good news is that you can’t go wrong with a limited edition piece– especially these pens. With graduation season and Father’s day just around the corner, one of the most popular gifts for men is wallets. They make great gifts and leather ones can even be monogrammed. However, there are several different styles of men’s wallets and if someone isn’t familiar with this product it can be confusing to buy. Hopefully, this handy guide will make shopping easier. The most popular style of men’s wallets is the bi-fold. This means that the wallets fold in half. From there you get into several choices. The first is size. On the small side, you have thin fold wallets that are designed not to be bulky and fit very well in any pant pockets. The downside is that they won’t hold as many cards. Larger styles, often called hipsters, have room for more cards but are taller and might not fit in the pocket easily. Some bi-fold wallets have a third pocket that folds out. This again will give more room for cards but will add bulk. One major choice to make in the bi-fold wallet is the option of an ID holder. This is a clear area of the wallet that is designed so you don’t have to take your ID out. This is very convenient but they sacrifice room that could be used to carry other cards. Almost all three pocket wallets have this ID area so if size is a secondary concern this might work. Another popular style is the tri-fold wallet. These are designed to go mainly in the side pockets. Tri-folds are narrow but can also get bulky due to their design. The typical design for them has areas for cards on each side and an ID window in the middle. Sometimes, there will be variations of this basic design such as no ID window or the ID window is on the outside of the wallet. Other popular designs are card cases and money clips. Card cases can come in many different styles but they don’t have an area for keeping money. What they lack in space they make up for with sleekness. Money clips usually look like card cases but have a clip, either on the inside or outside, to hold money. One newer trend in wallets is RFID protection. RFID blocks the ability for thieves to read your credit card information contained on a chip embedded on your card. For a more detailed explanation, check out this past blog. This might make a good gift for a man who travels quite a bit. The best way to figure out which wallet to purchase is to look at what he is carrying now. People are creatures of habit and a wallet is a very personal item. The best bet is stick to the style they have now unless the person you are buying for expressed an interest in changing what they carry. After all, gift giving isn’t the time to reinvent the wheel. Comic books and the movies they’re based on are all the rage right now. Due to their popularity, all sorts of items are now branded with superheroes on them. One must have item for the serious Marvel fan is Cross’s collection of superhero inspired pens. These pens are a great way to bring a bit of fun into a formal workplace. When other comic book fans look at your writing instrument they won’t be able not to smile. There was a time when comic books were mainly for young people; however, this is definitely not the case anymore. All ages can and do enjoy the complex stories that are now being put out by the comic book makers. Marvel comics has evolved into a major player in superhero comics and movies. Marvel comic fans just love anything that has to do with their favorite heroes. Cross has been a maker of fine writing instruments since 1839, so the know how to make a pen. Among their innovations, in 1953 they introduced the modern ballpoint pen. Many collectors include Cross pens as an integral part of their collections. When you purchase one of these superhero pens you are not only receiving an item that is aesthetically pleasing, but functional as well. The Select Tip pens are designed to be perfectly balanced and the ink flows as freely as a fountain pen. Another unique feature is the ability to convert the pen to a ballpoint or felt-tip with just a refill change. If you are a pen collector who is also a superhero fan or looking for a gift to connect with one, then Cross’s Marvel series is right for you. While looking at this pen also check out Cross’s other fine writing instruments. They are sure to please any pen collector. Montblanc has once again designed a masterpiece: The Montblanc Writer’s Edition Leo Tolstoy Pen (available in the fountain, rollerball and ballpoint styles). Montblanc chose well in honoring this special man, philosopher, but mostly, extraordinary writer. Tolstoy is best known for his novels War and Peace and Anna Karenina but he also contributed notable works in the spiritual and religious realms including A Kingdom of God is Within You and Resurrection. His writings have not only influenced generations of readers but also instrumental leaders of change including Mahatma Gandhi and Martin Luther King Jr.
Much of Tolstoy’s work is “art imitating life”. His early books reflect his life as an aristocrat living in a society of excesses and a soldier serving in a violent war. While his later writings reflect his conversion to a religious man, leading the life of a Christian anarchist and pacifist; a man wanting to give up everything material and striving to remove violence from society and his own day to day existence. As Tolstoy grew as a writer, he changed as a man and his life came to imitate his art. 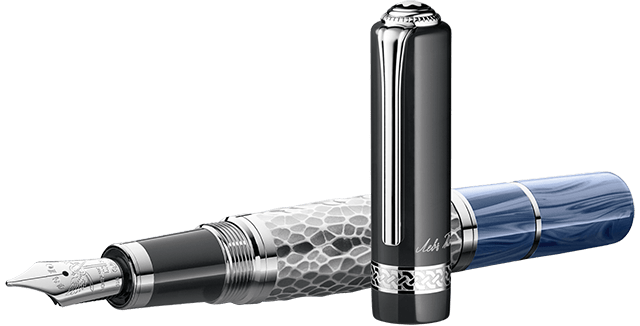 Anyone who has read his significant body of work will understand Montblanc’s decision to pay tribute to this remarkable man with this amazing limited edition pen!